Blogging with MODX (the content management system that this website uses) is a joy because you have so much flexibility with what you do with your content, and how you blog it. 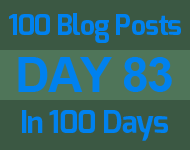 For example I started this series of posts off as a regular blog, I was going to post every day as 100 blog posts in 100 days challenge, but I found I just don't have the time to write something substantial for each post on such a regular basis. So now these posts are all pre written and programmed to be published on the appropriate days. But because they are quite insubstantial they are all designated with a noindex HTML meta tag so Google doesn't construe them as auto generated thin content.